At Jim’s Test & Tag, we specialise in maintaining safety in workplaces all around Australia. This includes electrical inspections as well as testing and inspecting fire protection equipment. Because we offer fire extinguisher servicing, we get a number of frequently asked questions from our customers. Today we’re going to tackle one of those popular questions – can fire extinguishers expire? The contents of your fire extinguisher can become ineffective over time. General wear and tear can also affect the functionality of your device. There is no set fire extinguisher expiry period in Australia. However, there are standards in place to ensure extinguisher and its contents are working properly. The AS/NZS 1851:2012 standard for the routine service of fire protection systems and equipment dictates how often extinguishers need to be tested and recharged. According to this standard, all portable and wheeled extinguishers need to be tested and tagged at least once every 6 months. Visual inspections, pressure checks, and refills will ensure that the contents of your extinguisher have not expired. Can fire extinguishers expire at home? If you have a disposable fire extinguisher installed in your home, take a close look at it. Is it a fire extinguisher with a nozzle or an aerosol spray can? Portable aerosol fire extinguishers come with a use by date which should be clearly marked on the canister. This period is usually around 5 years from the date of manufacture but it will vary based on the brand. For more information about the maintenance of portable aerosol fire extinguishers take a look at the Product Safety Australia website. There are a number of places you can look to find the manufacturing date of your fire extinguisher. The date should be stamped at the bottom of the cylinder, or be printed as a number below the label. If you have a Kidde fire extinguisher, check out this guide to finding the manufacturing date. Most brands follow a similar system for their labelling. Can fire extinguishers expire? Yes. They may not have a certain expiration date but the contents can certainly become unsafe for use over time. Extinguishers need a certain amount of pressurised gas to remain effective in an emergency. Over time, that gas can leak out of your device. This means that when you try to use your extinguisher, there may not be enough gas to propel any of the content on to the flame. 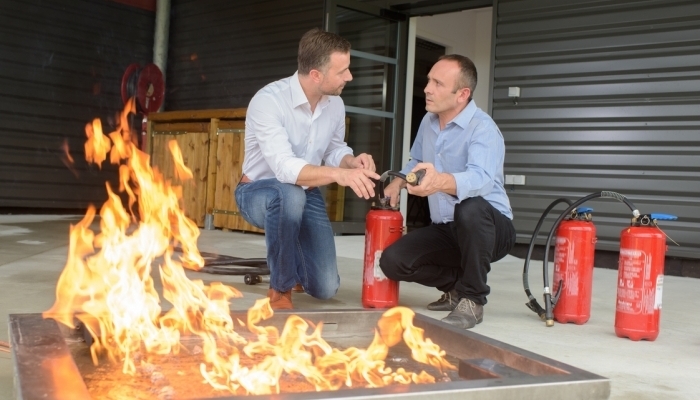 At Jim’s Test & Tag, we offer extinguisher inspection services to businesses across Australia. We work in accordance with the latest Australian standards to ensure your fire protection devices operate correctly when you need them to. If you have an extinguisher that has been left unattended over time, or has been recently used please contact us immediately. We can come to your property and perform a number of tests to make sure your equipment is safe. We also supply and install extinguishers, so if we do find a faulty device we can always set you up with a replacement. We hope you found our “can fire extinguishers expire?” article helpful. If you have any questions you’d like us to cover in our next post – or any enquiries at all – please call us now on 131 546 or fill in the contact form on our website.